So here goes with my wish list.....hope it doesn''t bore the socks off you dear readers. I really want to streamline my wardrobe this year so I am starting with basics as I really am only really looking to enhance what I already have. First item on the agenda is a new pair of jeans. Without a doubt my purchase of the year has been a pair of ripped skinnie's which I picked up in H&M for all of £10, with that in mind I researched some new ones and I have narrowed them down to these ASOS Ridley ripped knee jeans. Hopefully they will give the H&M ones a much needed rest! No wish list would be complete without boots! As I was dashing out of Clark's after the purchase of the dreaded school shoes I spied this Lolly Dawson style. Love the fact that they are totally flat and look fab with super skinny jeans which sit neatly just inside these boots or skinny jeans that fit outside the boots well too. When I was paying for the school shoes, Clark's were good enough to slip a 20% off voucher in the bag so I have already made these mine, I will do a show and tell soon! 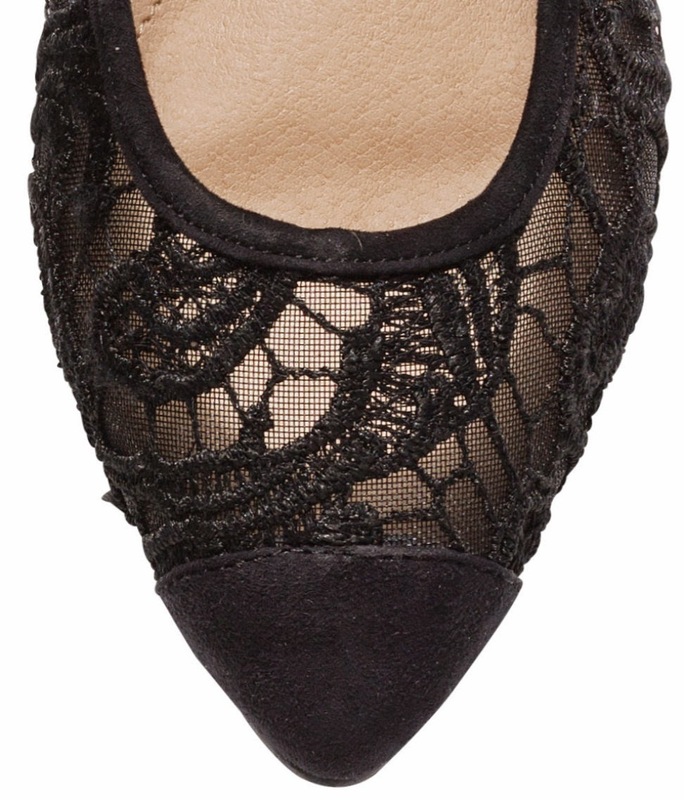 Sticking with footwear which as I have mentioned before seems to be my Achilles heel, I've ordered these lace flats from H&M. Another item which will be useful, I was thinking these would look great with skinnies and a blazer should I have the occasion to lunch with the ladies (a few birthdays coming up including mine!) and dress up a bit! I was also thinking they would be fab with my Mango jumpsuit instead of heels and also with my leather look pencil skirt which I am still yet to wear! At £14.99 it would be rude not to partake in a purchase! 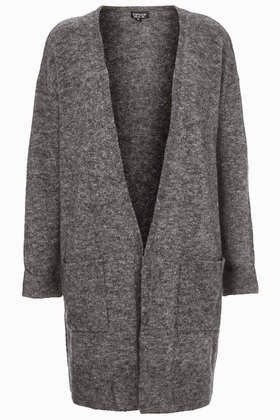 I think this slouchy boyfriend style cardigan, would work perfectly over the above Breton. This one caught my eye in the window of Topshop. Brilliant for now with a few layers instead of a coat. I was a huge fan of the shirt and sweater comb last year and so I started my research to find the perfect shirt for this year. 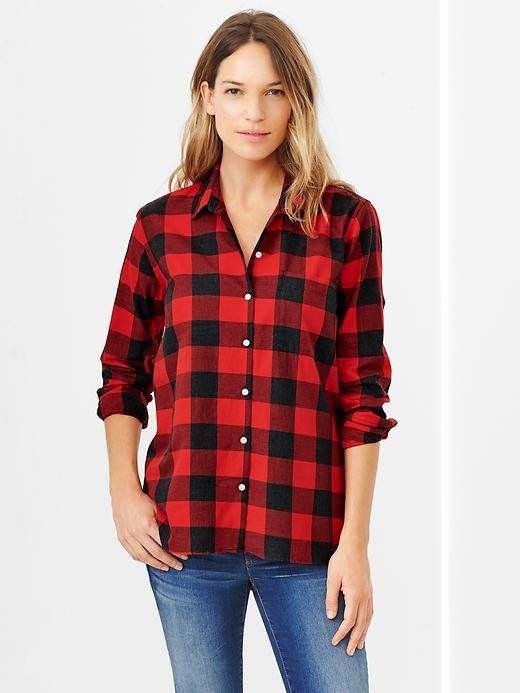 Love this red and black from Gap, I think this one will look brilliant with a black round or v-neck sweater....more on those below. 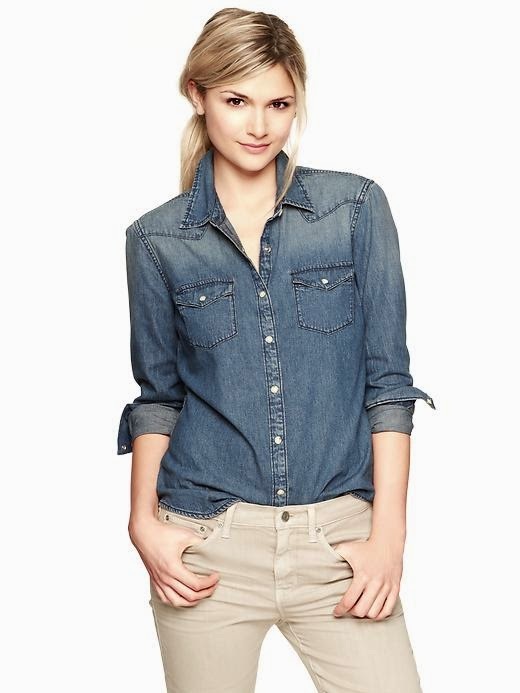 Another style staple I'm looking to update is a denim shirt, my current H&M one is quite stiff and although it has stretch it is still quite rigid so I am looking for a softer version and I have eyed up and decided on this one also from Gap. More basics as we move onto some knitwear. I am just after a couple of simple v-necks and round necks. I have bought merino from Uniqlo before and have been really pleased with the quality and how well they wash and wear so first up I'm after this grey v-neck. I'm also after a plain black crew neck, see here. I am going to wait to get into a store before I purchase these as I want to compare the men's and women's fit after reading Susie So So's post. Last but not least I think my list would be incomplete without a new coat. This is where I need to reign things in a bit this season as I purchased 5 new coats last year! The one gaping hole I have amongst my coats is a bit of leopard print. 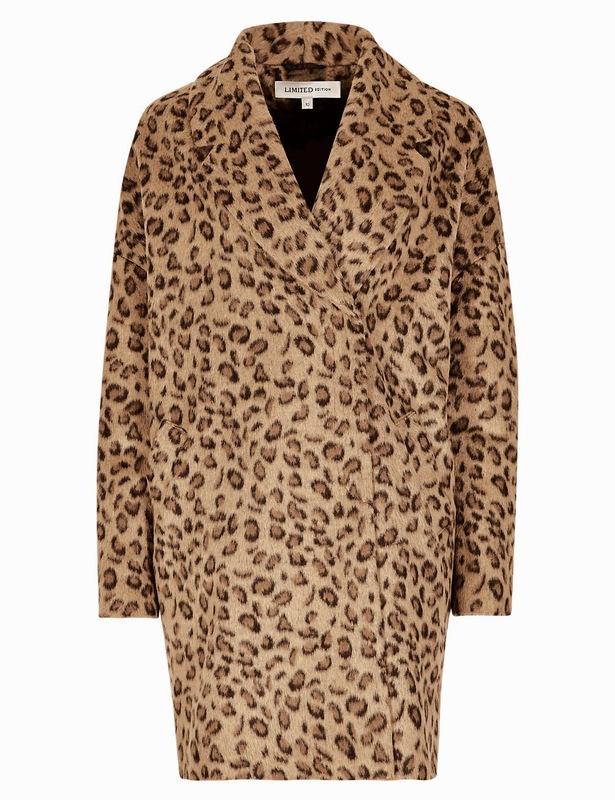 I spied this Marks and Spencer Limited Edition coat in store and was immediately enamoured by the cocoon shape. Love it in real life, I think the colour looks a lot better, a bit more muted than the M&S website would suggest! Thank goodness I have a birthday coming up so that I can justify getting it! Looking over my list, it is striking me as a tad.......dare I say it...a bit grungy but that's not a bad thing for me!! My favourite look which I discovered late spring was this ensemble of a Superdry leather jacket (courtesy of T K Maxx) Zara cupro T-shirt, the aforementioned H&M ripped skinnies and Kurt Geiger Laurel skate shoes (you can them here with 20% using code KGSEPT20). This outfit has been the inspiration for some of the Autumn/Winter purchases as I felt so comfortable in this. If I've realised anything since I've been blogging it's better to build on what you've already got! I think I've learnt to buy better as (even with the cheaper high fashion things) I buy more for my actual lifestyle, as in what's suitable to wear on the school run and to do the food shop in.....as on the whole my life doesn't get much more exciting than that! Don't get me wrong I'd love to dress like Victoria Beckham everyday but I just don't have her lifestyle (or budget) and so I'm getting practical! I think when I discovered blogs and Pinterest I tended to buy everything I loved and ended up making a few mistakes because I didn't get the wear out of certain things and would end fed up with them after a season. So now I'm trying to buy more classical basics that go with everything and make my wardrobe work a bit harder for me. So do you have a plan for you Autumn/Winter wardrobe to or is it just me? So here are just a few of the looks I've been donning over these past few days.....yep the black is already featuring heavily! I would love to hear all about your Autumn/Winter plan! Be back soon.....I may have already found another little gem to add to the ever growing wishlist! 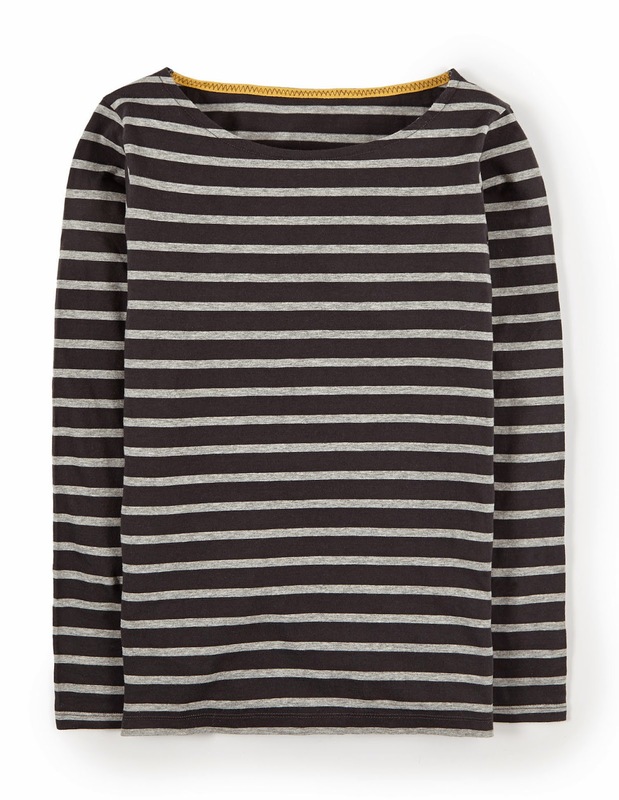 I have the white / navy stripe boden Breton from 2010 still going strong but I'm going to order a replacement to stash away as I like them so much. As for an a/w plan... Wear everything I already have basically. I'm on SMP now so not an awful lot, if any, disposable £ for clothes now! Not in the least bit boring Michelle, I agree with your sentiments about lifestyle, blogging etc. lovely choice, I will be checking out the Clark's Chelsea boots of course, and I love your choice of colour palette, in my head I'm going for grey, black, navy this a/w. Love your style as always, very Aggie. Great post as always. Ooh some great picks Michelle, needless to say I'm loving the leopard print coat!! I've brought quite a few basics on holiday which I'm hoping will add new lease into my wardrobe - again mainly blacks, greys & navy with some injections of hot pink to brighten everything up! I too received a £10 Boden voucher today so know I know what to spend it on!!! Great ideas as usual, really enjoy your blog. Great post. Absolutely love the Topshop cardi and also the leopard print coat. I agree that blogging can distract you into buying things you may not wear , so it's good to have a plan. Still working on mine!!! Your picks are so well researched. In particular I am rather taken by the Chelsea boots. I have an inkling that I'll be blaming you for more shoe purchases that I'll be making this season. 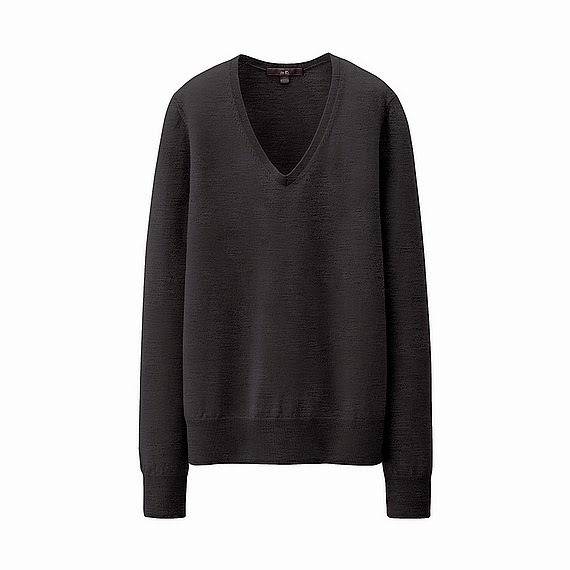 Thanks for reminding me about the Uniqlo jumpers as I am after a grey v neck but it has to be long in the body so I'll follow your lead by waiting until I can visit a shop and see how the men's version measures up. Your outfit posts are as super stylish as ever. My plan is to buy solid colours(as I tend to buy all sorts of patterns and then nothing goes together! ),a bright blue blazer/jacket and black boots. Thank you Evi, I was in 2 minds as to whether to publish this post as I thought readers might find it a bit boring but I am so glad I did as I've had some great comments!! Absolutely right to publish this post because a lot of this will resonate with a lot of people out there - it's better to stick with what actually works with you and your lifestyle and that is what I have been learning over the last couple of years. Hence I seem to make quite erm "reserved" purchases but I deem them more useful and versatile than those items which have the immediate wham factor. So yes, I'm continuing in what I actually feel comfortable in. The leopard coat looks lovely on you - it didn't look very good on me - I think your extra few inches height helps where as the rounded shoulders died on me a little. I suit neater shapes. And I actually quite liked the little H&M one when I tried it on in store this week - I had to leave it behind as I was in such a rush but I might order it yet! Look forward to your write up about the Uniqlo merino jumpers and what the differences are! What I can't work out Sue is how long it took me to get this point of what suits me and my lifestyle! Lol! Having said that I'm glad I'm here now and that my wardrobe is making sense at last!! I've had a bit of a purge on eBay of things I just don't love enough so I have made quite a few purchases already and I have to say I'm getting really rather excited about my A/W stuff this year! Less is more is going to be my mantra!! Really great plan to stick with classic pieces, I do try to do this as well but end up going off piste! I adore the skinnies with knee rips, please get them, I can already see you in them! Amazing looks - totally in love with them all! I tried the Tooshop grey cardigan on, it's lovely but runs large. The 12 drowned me and I would usually be a pretty comfortable 12. They cardys are on the large side aren't they! I may have to turn my attention to the H&M cashmere one.....I still have 25% off voucher burning a hole in my pocket and that would bring that cardigan in at the same price as the Topshop one! Great picks Michelle - you have such a good eye! I love the long cardigan! 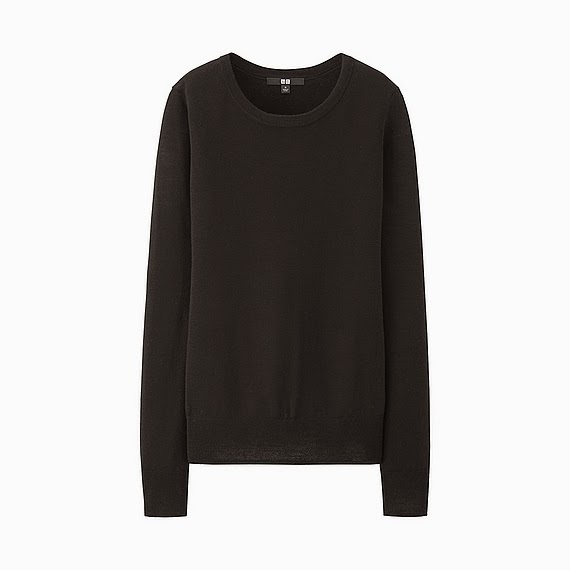 For what it's worth I have the men's cashmere Uniqlo crewneck in a M and love them - nice and slouchy but not too long. Thank you Joanna! I'm getting strict with myself in hope that I don't make as many wardrobe mistakes! !